Straighten your teeth discreetly with Invisalign in Williamsville, NY, Elma, NY, or Orchard Park, NY, at More Than A Smile Orthodontics! As a Preferred Invisalign Provider, our orthodontics team has extensive expertise in creating healthy, beautiful smiles with the revolutionary technology of clear, removable aligners. Invisalign can be a great option for both teens and adults, and it provides a level of discretion that exceeds even clear braces. Invisalign treatment from More Than A Smile Orthodontics provides numerous benefits to make straightening your teeth as easy as smiling. True discretion. Invisalign provides the ultimate discretion for straightening teeth – even more than clear braces, which still require a visible metal wire. With Invisalign, no one needs to know you are undergoing treatment unless you choose to tell them. Improved comfort. Invisalign doesn’t use brackets, which means the inside of your mouth won’t get sore or raw from chafing brackets. Invisalign’s smooth plastic aligners provide a comfortable experience throughout your treatment. No diet restrictions. With metal or clear braces, you must avoid certain foods that can damage or break the brackets. With Invisalign, however, you simply remove your aligner while you eat. That means you can sink your teeth into whatever you like. From crunchy apples to sticky gum – the sky’s the limit! Easy oral hygiene. Braces require extra care to remove food particles that get caught in the brackets, and getting the floss under that wire can be tough. Once again, Invisalign’s aligners come to the rescue. Remove your aligner to brush and floss as usual, and then pop it back into your mouth when you’re done. No impact on your hobbies. With braces, many musicians find they need to undergo an adjustment period during which they essentially relearn how to play their brass or wind instrument. Athletes also need to take extra steps to protect their teeth and appliances by wearing pricey, custom-made mouth guards for braces. Our orthodontic treatment with Invisalign in Williamsville, NY, Elma, NY, and Orchard Park, NY, uses removable aligners that let you skip the inconvenience and keep enjoying your hobbies as usual. Invisalign uses a digital 3-D model of your teeth to create a set of aligners custom-designed for your unique smile. First, our orthodontist meets with you during your free More Than A Smile Orthodontic Assessment to determine what needs to be corrected. Next, your customized treatment plan will be sent to Invisalign’s specialized lab, where they use highly advanced computer technology to finely calibrate a sequence of aligners for your unique smile. Each aligner represents a different point along the path that your teeth will move. Depending on the treatment plan that our orthodontist develops with you, you may receive as few as 10 or as many as 30 separate aligners. You wear each aligner for about two weeks, taking it out to eat, brush, and floss. As you replace each aligner with the next in the series, your teeth gradually move into their final alignment. You will visit our orthodontic office approximately once every 6 weeks, so that your progress can be monitored and you will also get the next few aligners for your treatment at that time. As you continue to wear the virtually invisible aligners, they gradually re-position and adjust your teeth into a radiant smile that you’ll be proud to show. 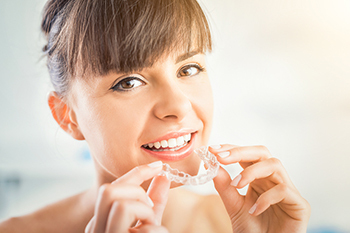 Not everyone is a good candidate for Invisalign, but our expert orthodontist can determine if clear aligners are right for your orthodontic needs. As a Preferred Invisalign Provider, our orthodontist has been specially trained and certified to evaluate your eligibility for Invisalign and develop a customized treatment plan for your best result. If you have been holding back from getting the smile you really want, give us a call! Schedule Your Appointment to Learn More About Invisalign in Williamsville, NY, Elma, NY & Orchard Park, NY, Today! Find out about all of the innovative ways you can achieve a spectacular smile with Invisalign in Williamsville, NY, Elma, NY, and Orchard Park, NY. Take advantage of your complimentary, no-obligation More Than A Smile Orthodontic Assessment today by calling 716.633.4747 or click here to use our convenient online appointment request form. Come experience More Than a Smile Orthodontics! You will quickly discover that we offer state-of-the-art and affordable Invisalign in Williamsville, NY, Elma, NY, Orchard Park, NY, Amherst, NY, Clarence, NY, Tonawanda, NY, Hamburg, NY, East Aurora, NY, Lancaster, NY, Buffalo, NY and West Seneca, NY – and we do it with a smile. We’re ready to help you achieve a healthy smile in less time!